Polex Environmental Engineering designs as well as installs dust collection systems and fume extraction systems for industrial environments. The company was assigned with the task of providing a cost-effective refurbishment of two massive existing reverse-pulse dust collectors in addition to providing the most efficient way to connect these dust collectors to heavy-duty recycling equipment within the factory. Weston Aluminium is a thriving aluminium recycling company, whose primary concern is environmentally-friendly production along with a clean and healthy environment for all employees. When taking on this project, Polex understood that only the most proficient solutions would be acceptable. The two dust collectors standing side-by-side measure over 11m in height as well as over 5m each in width and breadth. Each dust collector contains 560 cylindrical filters bags, each of which is 3m long and suitable for filtering abrasive aluminium oxide dust. These dust collectors are capable of a combined airflow capacity of 35m³/s. Along with the filter change, Polex was responsible for the replacement of pulse valves and compressed air particulars where necessary. The design expertise of Polex engineers was called upon when attempting to create a ducting system that involved a multitude of duct-runs internally, culminating on the outside before connecting to the dust collectors. The discharge ducting led to two individual belt-driven 90kW centrifugal fans, each servicing their respective dust collector. Both fans attached to ducting that merged into a common exhaust stack measuring 1500mm in diameter. A stand was designed and constructed using a largely SHS frame, whose job was simply to support the massive stack against any wind loading. To comply with DECC licensing requirements, the air velocity in this stack needed to achieve a minimum of 20m/s. A requirement of the project was to utilise existing ducting throughout the plant where possible. This required careful installation planning to ensure Weston’s production was not impacted during the relocation of components. All new ducting installed throughout the project was manufactured by Australian duct manufacturer, Ezi-Duct Pty Ltd.
All ducts, bends and branches were supplied complete with fully welded heavy-duty rolled angle flanges. All bends and branches were fabricated from 3mm thick galvanised sheetmetal while straight duct were made from 1.5mm thick material. Cutting and welding was undertaken onsite to ensure exact lengths. 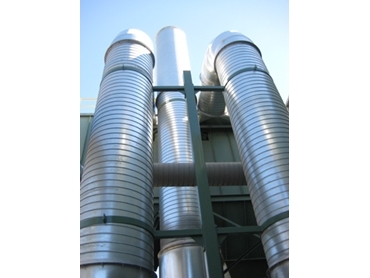 The dust collector refurbishment and duct upgrade is designed to provide many years of trouble-free operation for Weston Aluminium. Polex was able to offer a solution to meet the client company’s budgetary constraints whilst meeting all operational requirements of the new system.